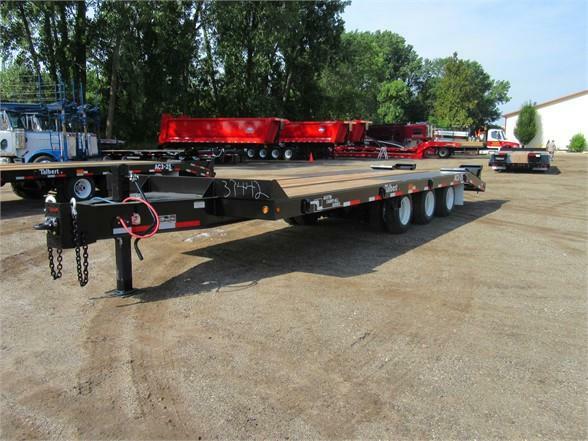 2019.TALBERT.25 TON TAG.TRI AXLE.102" WIDE.24' FLAT DECK.5 FOOT SELF CLEANING BEAVERTAIL.HUTCH 44,000 SPRING SUSPENSION.2157517.5 16 PLY RADIAL TIRES.LOCKABLE TOOLBOX.12" HI TENSILE STEEL MAIN BEAM.32.75" LOADED DECK HEIGHT.6 INCH HI TENSILE CROSSMEMBERS.CROSSMEMBERS ON FLAT DECK ARE ON 16" CENTERS.CROSSMEMBERS ON BEAVERTAIL ARE ON 12" CENTERS.8 INCH HI TENSILE SIDEMEMBERS.17.5x6.75 HUB PILOT STEEL WHEELS.ADJUSTABLE PINTLE EYE.FOUR LASH RINGS PER SIDE.SELF CLEANING SPRING ASSIST RAMPS.1 1/2 INCH APITONG DECK.22,500# HEAVY DUTY XXN AXLES.2S1M ABS.8" HEADBOARD.PAINTED VALSPAR BLACK. TOP QUALITY TRAILER!! !GREAT PRICE OF $25,999.00 PLUS F.E.T.!!!!!!!!!! !